Just coming in to flower if you got started early and beginning to make a show at the markets, is cauliflower. A winter vegetable of the brassica family which has a reputation as a one hit wonder of 'Cauliflower cheese' fame. Cauliflower plays a poor second to its green cousins in this household but this one was just so firm and heavy, tightly budded and pure white that i couldnt resist. But it sat on the counter top until a yellowing leaf really prompted me to use it before all those features that got it entry into the house, disappeared. Refusing to do cauliflower cheese, which everyone does love, and trying to do something a little less button busting, i decided on... pasta. This dish uses a whole cauliflower a provides a good serve of vegetable per person. Cook whole cauliflower in salted boiling water. While still firm, remove from water and reserve water. In a pan heat half the oil and add finely chopped onion.When it begins to turn coour dd saffron which has been softened i little warm water. Cover and cook for 10 minutes. Divide cauliflower into small florets and add to onion mixture with anchovie fillets, nuts and raisins/sultanas and cook until fillets have dissolved. cover remove from heat and leave. Cook pasta in reserved cauliflower water. When al dente, drain and add to cauliflower mixture with cheese and chopped basil. Serve. This 'sauce' was surprisingly tasty and we had it served on organic Australian multicoloured penne. The sauce was sweet, full of complexity and just about perfect. It got the big thumbs up from everyone, especially the kids. I dropped the anchovy fillets back to jst 1 as b2 will eat 1 fillet as it adds saltiness without the fishyness. 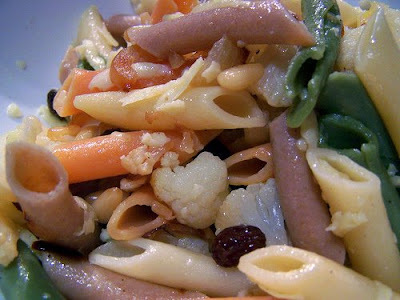 I have tried 3 or so in other dishes before and been rightly busted and she had plain pasta that night. We had no sultana/raisin so i 'foraged' a big handful out of our muesli bin and brushed off the oat dust! I also would use almonds next time as they grow locally but i found some pine nuts in the fridge so i used them up and we generally only buy local cheese so we had some chunky grated SA pecorino on top. Local salt instead of anchovy would suffice if you want to up your loca content (unless you can find local anchovies and let me know!) and retain its vegan status, without the cheese of course. This will definitely be on our menu again. This looks great Kel, I'm not sure they boys would go for it though - bugger..!! When I cooked at a (vegetarian) long daycare centre in Victoria one of the Winter soups I did was cauliflower, potato & zucchini...it was a huge favourite with the children (and staff). Cauli pakoras are popular here to have on weekend afternoons with a drink before dinner. Sadly, it's a very underrated vegie. One of the simplest things I do with Cauliflower is a soup...it has one cauliflower, one leek and stock (we use the Massell stock cubes but am planning to try fresh stock). Let it bubble away for a while and zoom it with a hand blender...and it is surprising tasty. it just so happens i have half a cauliflower in the fridge that was destined to be covered in cheese sauce tonight.... but that pasta looks delicious! I reckon I might try it, although I have no sultana friends, maybe just some apple? Kel, Ive been looking for a few more things to do with figs as our tree is ripening about 1 kg per day at the moment (!)... i think you mentioned a jam of some kind that worked as an accompaniment to cheese? Did you blog this recipe, or am i imagining it? Crumbed cauli! Lightly boil florets in salted water. Dry, let cool. Then crumb florets. Fry till golden brown. Delish! Cauli curry! Served with rice or naan. Cauli/veg stir-fry. Cut cauli in 1cm slices, fry with garlic & onion (and speck if non-vegetarian). Add other veg, if desired. Seasoning of your choice. Throw in soaked vermicelly, if so desired. Or serve with pasta, or couscous, or quinoa, or....or on a creamy/garlicky polenta. We still have cauliflower around here too and I had a cauliflower side of it recently at a restaurant. It was au gratin, I think, with onions, cheese and bread crumb. And magic deliciousness. I was swooning for days. And it was cauliflower. Not generally swoon food. This sounds pretty good too. The combo of the raisans, cauliflower and cheese. I could almost stop there but wouldn't. kerrie- ahhhh pakoras...but they're fried!!!!!! our problem is one of the kids loathes soup! i mean just HOW inconvienient is THAT? silver Rookie - hi. welcome! see above re. soup. its driving me nuts. maybe i will just have to get her to have toast on soup nights?? jen-yes i will email you veggies (aka maggie beer) pickled fig recipe. its really wonderful. ive eaten half a jar so far and ive only had them a week! soup issues-see above! veggie-yum yum. glad i posted! soo many good ideas but i am trying to NOT FRY ANYTHING people! kale for sale -ahhhhh gratin, perfect name! swoon food indeed. 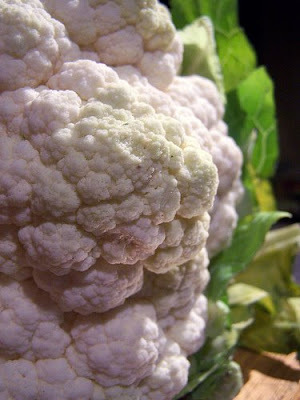 cauliflower was made for cheese, like tomato and basil or chocolate and hazelnut...just not so glamourous!